Rockstar’s Red Dead Online beta is getting a major update on February 26th, and it’s set to introduce a whole range of new features, balances, and improvements. The bulk of the improvements, it seems, are designed to rein in some of the game’s more persistently aggressive players – or as Rockstar puts it, to minimise “certain types of destructive player behaviour” – following community feedback. As part of this goal, Red Dead Online’s new update will reduce the distance at which players appear to others on the mini-map. After the update, anyone over 150 meters away won’t be visible, unless they fire a weapon. Rockstar says it’s hoping this will prevent instances where players are “repeatedly targeted across the map at long distances”. Additionally, as a player’s behaviour grows more hostile, their mini-map marker will change colour, gradually turning from blue to dark red. “Your visibility increases through bad deeds such as attacking and killing other players or their horses outside of a structured mode, Free Roam Mission, event or competition,” explains Rockstar, “and the shorter the time between bad acts, the more your visibility increases.” Tone down your brutish behaviour, however, and the marker will return to its original colour over time. All this is supported by new Law and Bounty system which awards players a bounty value based on the severity of their crimes. Killing another player will result in a steep bounty, for instance, while lesser crimes, such as assaulting townsfolk or animal cruelty, will result in smaller penalties. Once a bounty passes a certain threshold, players will need to watch their back; NPC bounty hunters will be dispatched to track down and kill the most nefarious of miscreants. Rockstar notes, however, that minor crimes, such as looting and ransacking, only decrease a player’s honour, so you won’t need to live an entirely spotless existence to be left alone. Elsewhere, Red Dead Online’s February update will see the introduction of Posse-wide Parleys (that can be initiated and applied to an attacker’s whole Posse after one kill), and improved Feuds. 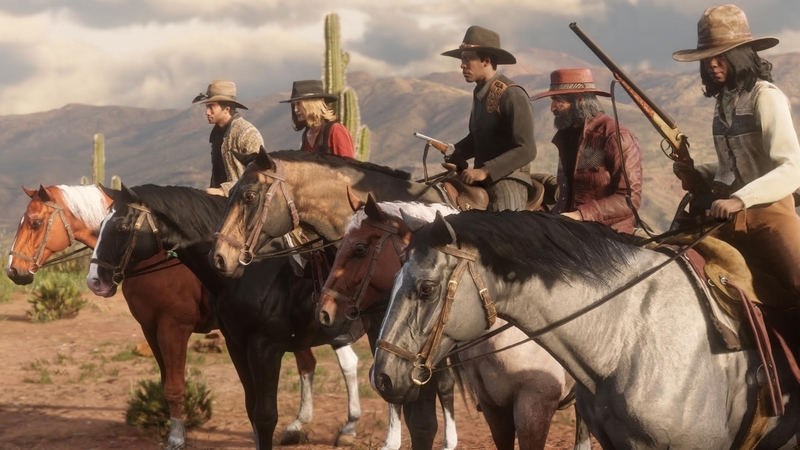 After the update, players will have the option to trigger Feuds, Posse Feuds or Leader Feuds after one kill, which, says Rockstar, turns a dispute into a “timed mini-deathmatch”, enabling rivals to battle it out in Free Roam, earning points for killing opposing players. All this, as a reminder, comes to Red Dead Online on February 26th.